For “collegeFund~college loan calc” related questions, you can email us at minjie dot xu at gmail dot com; or uudaddy at gmail dot com. The app itself is quite self explanatory. Here is the link to iTunes App store. Planning college savings is not an easy job. Many factors come into play: such as the cost of college education (tuition, room and board, other mandatory fees, books and computers), the award of scholarships, the financial aid, and so on. CollegeFund app is trying to help the parents (sometimes grandparents, and/or other family members if they are willing to chip in) to plan their kids’ college savings account. Given a set of input: current annual college cost, current savings, how much you plan to save annually, your kid’s current age, the age starting college, the age of graduating, the calculator will return how much the annual income you can expect from the college saving account vs. the future annual college cost (Coverage ratio), and how much you have saved toward achieving the goal (Saving progress). 4) Usage of local currency. Fix bug in collegeFund tab. Fix “data not saved when app placed in background or quit” issue on iOS 4 or newer. Add “auto pilot” option, in which the app sets coverage ratio to 80%, while calculating how much annual savings needed to reach the goal. Make glossary navigable; add “volunteer translator” and “tell a friend” buttons; add review reminder. 1) Add “months” in addition to the “years” for current “age”. 4) Fixed the width of text field for “Current Savings”. I will explain some of those in more detail in the following sections as I lay out the usage of this app. 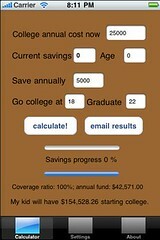 In the case of new born (current age = 0; current savings = 0; save annually = $5000; Go college at = 18; Graduate at = 22). Tip: when input data, it’s best to use “x” to delete the existing data, and then enter your own. Tap the background to dismiss the iPhone native number pad. Change the scenario a bit, suppose the kid is 10 years old, and you start to put away $10000 (instead of $5000 for the new born in previous case). The results is shown below. You may notice the coverage ratio is 86%, still ok, but not as good as the previous case (100%). From the above two scenarios, we can see the earlier to save (even save less money annually), the better the results. The default investment return rate is 6%, and default college cost (tuition) rate is 3%. I think those are reasonable numbers for default. Meanwhile, the user has the option to change the default in the “Setting” tab, just touch the numbers in the picker, and touch the “Set rates” button. 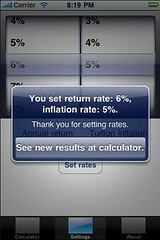 When the user return to the “Calculator” tab, the results will be re-calculated to reflect the new rates. As we can see from the following, when the inflation rate changed from 3% to 5%, everything else kept the same for the above scenario 2, the coverage ratio dropped from 86% to 73%. Not insignificant. Inflation is eating into the real return of investments. 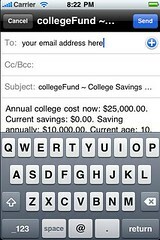 After the user performed one successful calculation, she/he can email results to herself/himself via. the Email results button. The input data is saved in the user iPhone’s local file system, after the user performed a calculation, and left the application via. the iPhone Home button. The next time the user launches the app, the input data will be populated with the data last being saved. 1) Why the income is larger than the cost, but the coverage ratio is less than 100%? 2) where is the icon picture and the “About” page picture. They are taken at Stanford university (Winter 2007) and Shanghai Jiaotong University (Spring 2007), respectively. 3) What if my son/daughter is a genius and he/she will get full scholarship for college? Well, first congratulations. But, one thing I learned from the most recent financial crisis is take nothing for granted. Higher education itself is not free, the only thing is someone else (the tax payer/donors in the case of state colleges; private donors in the case of private colleges) provided the scholarship. We know many states are not the great shape fiscally, some have cut back on the higher education. In the case of private foundations for colleges, some have suffered great loss during the recent crisis. Even in the best case scenario: your kid does get full scholarship, it does not hurt to have some college fund for your niece, some money for your kid’s iPad (maybe required then), or if you are fortunately enough, give that to the kids who work really hard and who could use your help. 4) What if I don’t have iPhone/iPod Touch/iPad? Understood. You can still use online college savings calculator like the one provided by Finra. The only thing is the online calculator does not save your results. So it’s up to you to take a screenshot or write down on your own, if you like to save results. According to the Internal Revenue Service, money in a 529 college savings plan can only be used for “qualified education expenses” including tuition, fees, books, and room and board at an accredited U.S. school. Should your child opt out of college, choose a foreign or unaccredited school or receive a full scholarship, you can transfer 529 funds to another beneficiary or pull the funds out and pay income tax on the withdrawal. You may also have to back taxes if you’ve taken state tax deductions over the years as well as a 10% penalty on earnings.